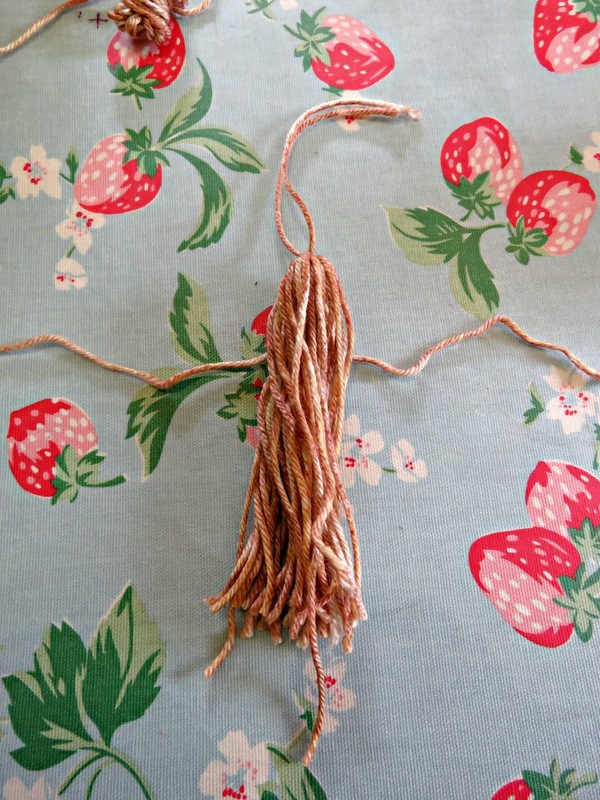 The purpose of this strangely-named post is to explain how to make luscious tassels. Let's be honest, there's nothing quite so under-whelming as a half-hearted tassel. You might as well just not bother if you're going to put some limp, skinny, under-weight effort on the fringe of whatever it is you're trying to embellish. Save the wool, and do something else! Sew on feathers, or add some sequins. Do something else, because tassels should be opulent and extravagant. 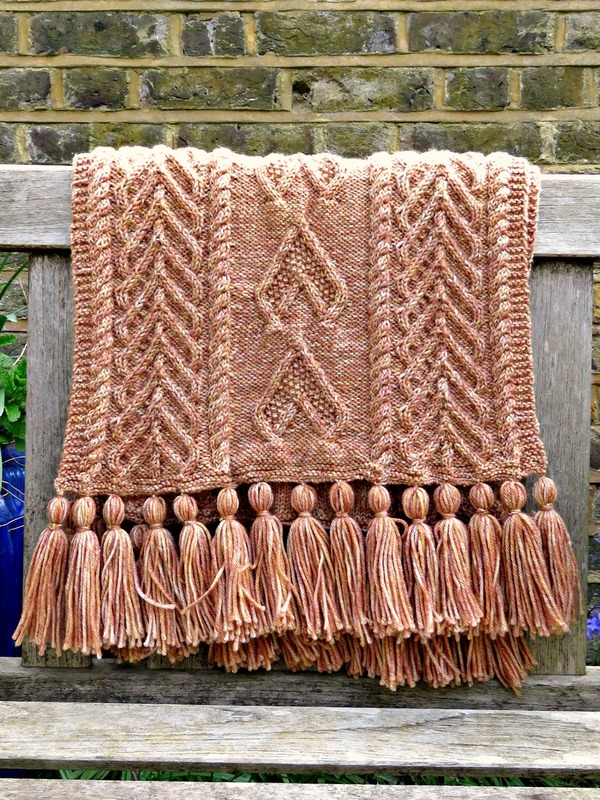 They have to be full-bodied and curvaceous to be tassel-tastic! 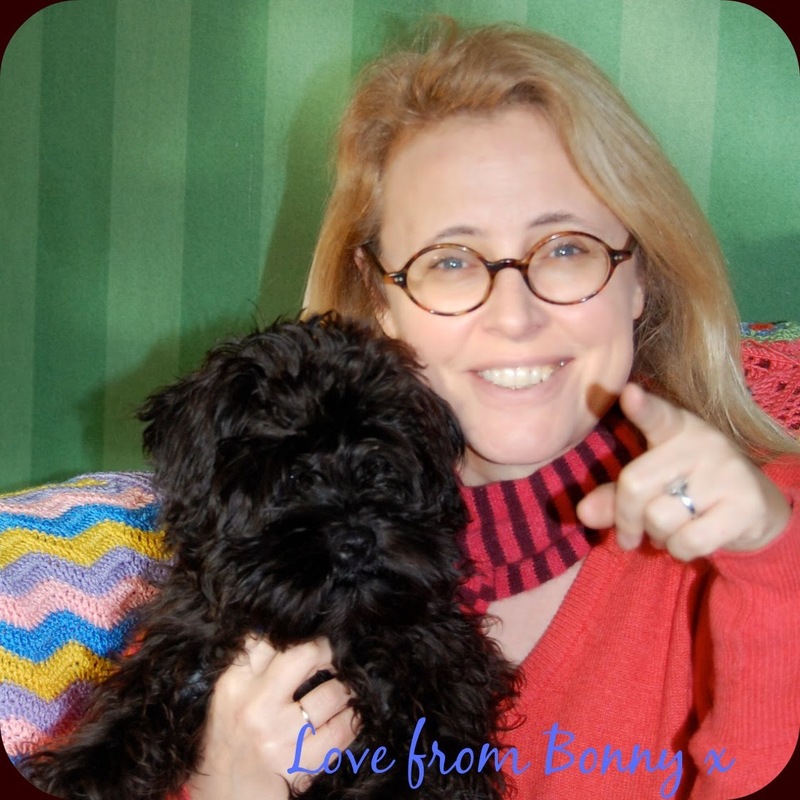 On my recent Queen of Hearts Stole I chose to go a bit overboard with some really lux tassels. I used over 80 g of wool making 30 tassels to sew on either end. It was very extravagant as I'd only used 540 g to knit the entire stole, but the investment really upped the wow factor of the finished item. My tassels measured approximately 13 cm in length. 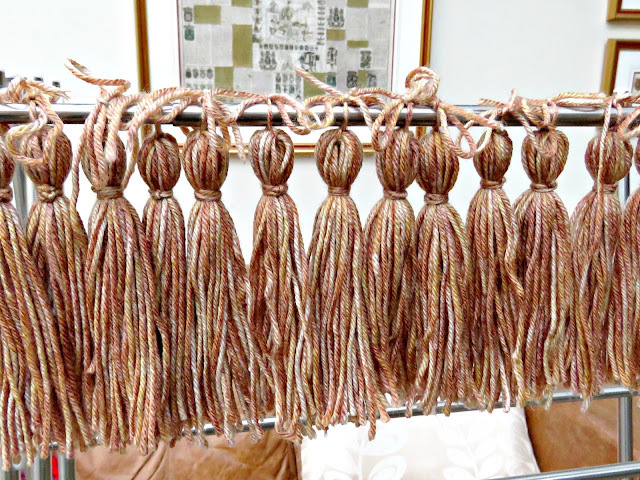 I made them by choosing a book that was roughly as wide as I wanted the length of my finished tassels to be. One of Emi's sci-fi books happened to be within reach at the time, so I went with that. Taking the wool I wound it around the book 20 times, starting down at the page-end, and cutting it on the last wrap. 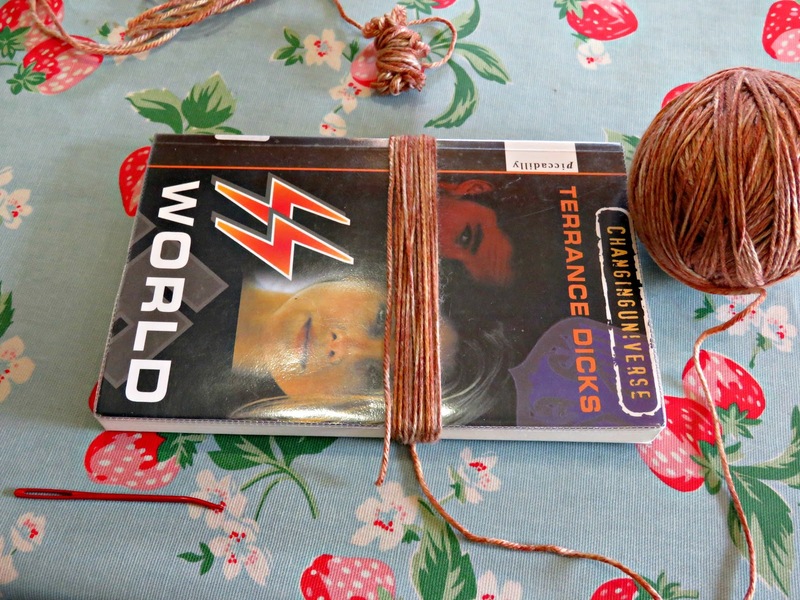 Then, I threaded a large-eyed wool needle with a length of wool measuring about 30 cm/ 12" long, and drew it under all the wraps of wool at the spine of the book. 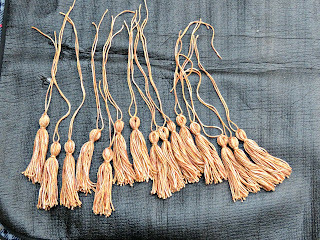 I tied it tightly with a double overhand knot, pulling all the lengths of wool in the tassel together. Next I turned the book around and snipped the loops of wool down where the pages were. 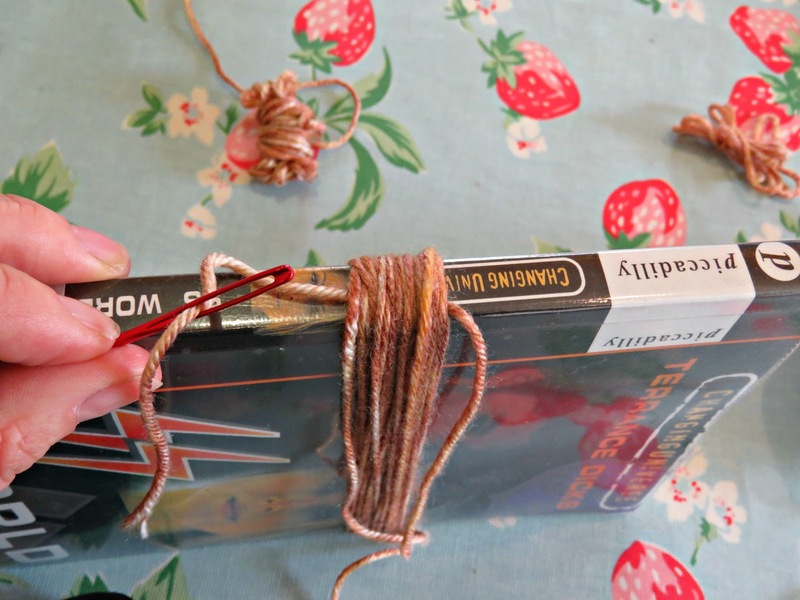 The shape of the book with the binding and the pages gives a little wriggle room to get your scissors in without pulling anything out of kilter. As best I was able I tried to cut the threads up the middle of the page ends, so that they would all come out, more or less, the same length. 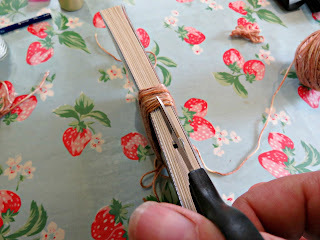 Then I cut another length of wool that was a little over twice the overall length of the tassel, and used it to tie around my tassel to draw it in and give it its perfect hour-glass shape. It has to be wrapped around a couple of times and finished off with a double overhand knot, tied as tightly as possible to keep things neat. This will leave the two ends of the tied knot sort of dangling outside of the tassel - a bit like a pair of legs hanging over a fence - not a great look! 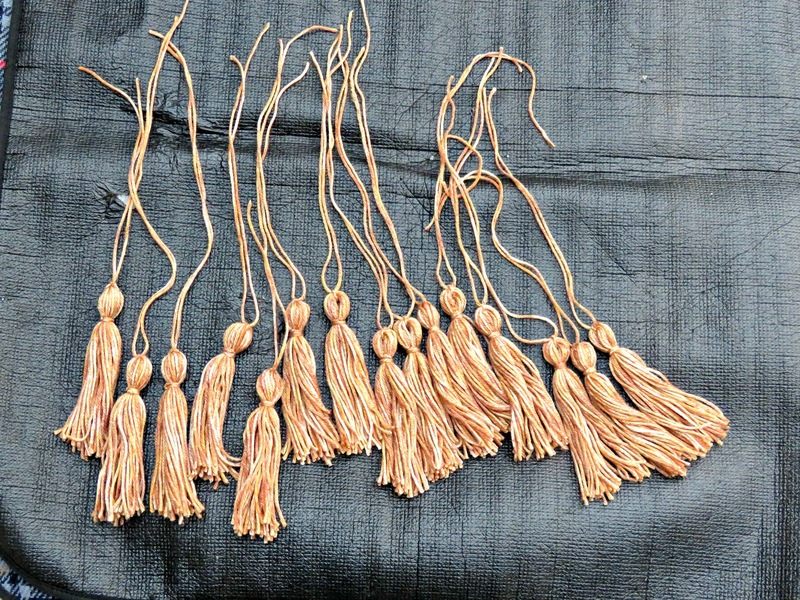 Using the wool needle I threaded them down through the bunch of threads in the tassel so that they're hanging inconspicuously in the middle of the tassel, looking like they belonged. 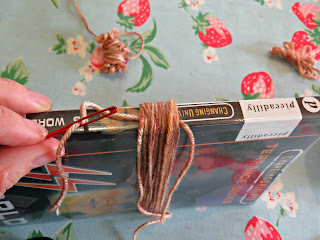 I hung the tassel up, tying it with the ends that were left when I tied the threads together at the spine of the book and trimmed any lengths that looked too long. It's best not to go mad at this stage. The better course is to leave things to dangle for a few hours and drop into place before chopping too much off. If your wool has been tightly wound on the ball before you've used it, you may find that you've got some kinks that don't look great. You can get these to drop out by leaving them to hang overnight, and, if they're very pronounced you can calm them down by steaming them with your iron and leaving them to dry off overnight. 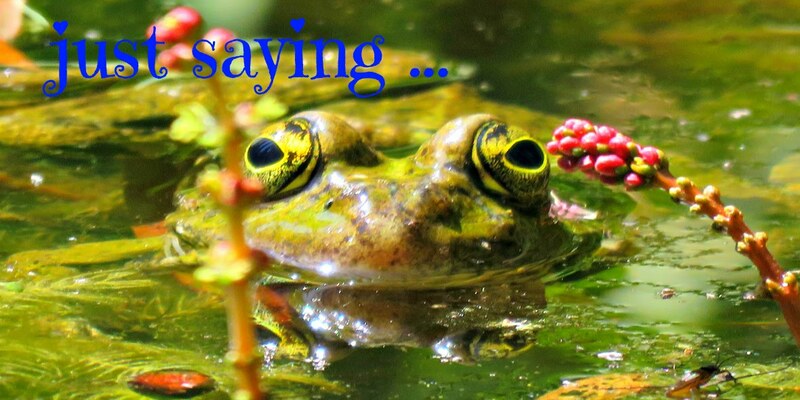 Gravity ought to block them into place as they drip-dry. Finally use the top-tie ends to sew your tassel to the fringe that you're embellishing. And ta-dah! - you're done. They really do make it perfect, don't they!